BioSmart® Far Infrared Heaters are the most advanced & efficient infrared heaters available. Our Far Infrared Heaters don’t use up oxygen or dry out the air like regular heaters. Our Far Infrared Heaters will operate for around $1.20 a day while heating up to 1,000 square feet. 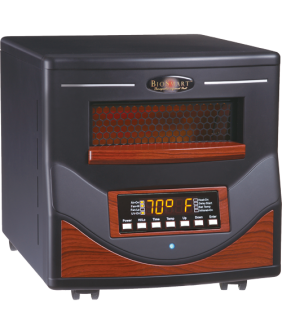 Portable Heaters models and pricing - click here! Far infrared heating technology is the most efficient way to turn electrical energy into heat. The far infrared waves produced in the BioSmart® Portable Quartz Far Infrared Heaters travel quickly and are absorbed by water molecules in the air which keep the heat evenly distributed from floor to ceiling and wall to wall, providing soft, comfortable heat, that is never dry or irritating. Far infrared waves also penetrate and heat objects in the room directly, which in turn radiate heat back into your home. You will feel warmer with infrared heat since it’s unique shorter wavelength makes it a more penetrating, direct source of heat, much like the way the sun heats. Find out why more and more consumers are choosing to use Far Infrared Heaters! By applying zoned heating principles, your portable infrared heater will save you up to 50% on your current energy bill. Zoned heating is a process by which you turn down your central furnace and use a more efficient heat source like a portable infrared heater to keep only the rooms which you are occupying at a comfortable temperature. You will no longer waste hundreds of dollars heating the unused areas of your home that you would normally heat with your energy-hungry central furnace. Find out more about how the Biosmart®portable heater can save you energy! 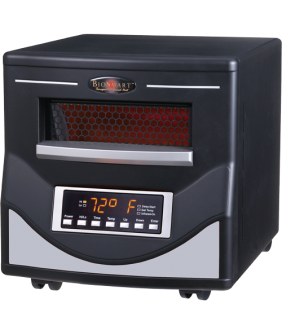 With a BioSmart® Far Infrared Heater, you can enjoy the benefits of safe, comfortable, therapeutic far infrared heat. In well insulated rooms where the external temperature is at or above 32° F, a single BioSmart®far infrared heater will heat up to 1,000 square feet (normal ceiling height – total room volume no more than 9,000 cubic feet) for only $1.20 per day (based on an 8-hour run time, using the national average of 10 cents per kWh). Find out more about how the Biosmart® portable heater can save you and your family money month after month, year after year! All of our BioSmart® far infrared heaters have an exceptional safety record and come equipped with auto shut-off protection and cabinets that stay cool to the touch so will not harm your children or pets. Our Buyer’s Guide is designed to assist you with any questions you may have about our product line. Learn more about what makes BioSmart® Far Infrared Heaters the most advanced & efficient infrared heaters in the world. 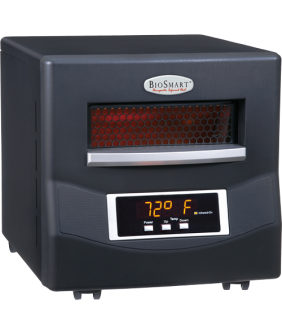 CALL 1-866-446-0500 to learn more or to place your order for a BioSmart® Far Infrared Heater. Don’t forget to ask about our special offers including multiple unit discounts!